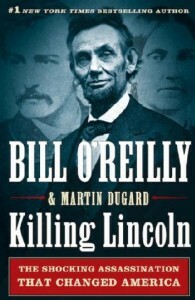 Bill O’ Reilly Book ‘Killing Lincoln’ To Be Made into Documentary By Tony and Ridley Scott!!! National Geographic Channel has teamed with Tony and Ridley Scott to produce a two-hour documentary based on ‘Killing Lincoln: The Shocking Assassination that Changed America Forever’ by Bill O’ Reilly. The documentary, set to begin production in the spring for an early 2013 premiere globally on the National Geographic Channel, will keep the fast pace of the book, described as a historical thriller with a John Grisham-style narrative about the 1865 murder of President Abraham Lincoln and the furious manhunt for his killer. Curious to see how this pans out. I’m glad to see the Scott brothers will be producing this. They do good work mostly. And with the Lincoln films coming out soon, this should fit right in with the whole Lincoln craze that seems to be going about now. We have the Abraham Lincoln Vampire Hunter film and the Spielberg Lincoln film coming soon. Your thoughts? Check Out the Trailer for ‘Abraham Lincoln: Vampire Hunter’!!! Check Out Honest Abe Fighting Some Vampires in ‘Abraham Lincoln: Vampire Hunter’!!! James Cameron’s Deepsea Challenger Documentary Has Release Date!!! Check Out The Trailer for Spielberg’s ‘Lincoln’!!! This entry was posted on Thursday, January 12th, 2012 at 12:32 pm	and is filed under News. You can follow any responses to this entry through the RSS 2.0 feed. You can skip to the end and leave a response. Pinging is currently not allowed. « ‘Chinatown’ Blu-ray Announced and Detailed!! !